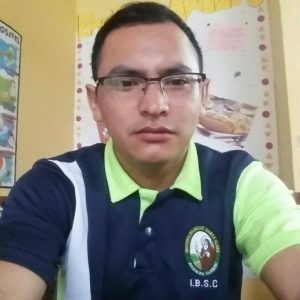 I joined Olancho Aid on January 25th, 2017. A friend of mine was hired first and he told me there was a teaching position available at Olancho Aid at CEBSC. I am a math teacher currently at IBSC. I am aware that part of my job is to inspire students to look beyond the pages of the textbook in order to become problem solvers and critical thinkers. My very favorite part of my job is spending time with students, and something else I enjoy is seeing that my students are doing well and that they are enjoying learning. I remember working and getting ready for the ‘’Feria Catracha 2017’’ (Honduran fair 2017) with my sixth grade students. It was a lot of work but the good part was that we won first place, and of course the children enjoyed it and learned. So I remember them celebrating such a great triumph. It was time to introduce a new topic, so I told the class, ‘’today we are going to go over the food chain’’ and one the kids said I know what that is, ‘’comida china’’ (Chinese food) he said. My class can be described in three words: interesting, challenging and amazing. I quite often smile after the picture has been taken.